Check us out on Facebook now! Several years ago, we discovered a fantastic support group with like-minded families and some pretty terrific kids, too. Since then we have participated in their annual Back-to-Homeschool Picnic. This event is for member families and anyone interested in learning facts about homeschooling. This year I thought it was bigger than ever! I heard others say the same thing. There were inflatables for the children and lots of games being played on a large, open field. Each family brings picnic foods to share and everyone eats together under the pavilion. During this time, we also set up display boards with information of upcoming clubs, activities, and teams to get involved in. It is such a wonderful time to gain information and to reunite with old friends we may not have seen since before the summer break. This is a tradition that we'll definitely keep enjoying for many years to come. Home School Physical Education- shows you several easy ways to fulfill home school physical education requirements. Cursive Penmanship- was created to help you teach cursive penmanship in a few easy, lessons. 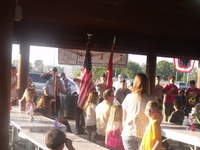 Home School My Child- is a veteran's answer to the question, "Should I home school my child?" Home School Reading Programs- shares helpful information about several home school reading programs we have used in our home. Free Sunday School Curriculum- looks at a site to download free Sunday School curriculum which can be used to teach homeschool Bible to your children. Singapore Math- explains why so many are looking to Singapore Math as their preferred math curriculum. Homeschool Worksheets- offers lots of links to choose free homeschool worksheets to supplement your curriculum. 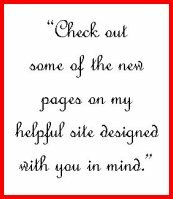 Take a look at these new pages and let me know what you think! Recently, my six-year-old son asked why we don't go to visit my mother-in-law at her house. So, I explained to him that my husband's mom sold her house and now resides in an assisted living facility in PA.
At first he didn't get it but I explained that she lived with other elderly residents in a family setting and that their meals are prepared for them, there. At that, he commented, "Oh, we should live in a place like that so we dont have to cook our food anymore." I was so tickled I had to run and share that with my husband who was home for lunch at the time. We all had a good laugh at that one. We never know what to expect from him, sometimes. If you are willing to share some of the funny things YOUR children say, please contact me and I will try to include them in this area. 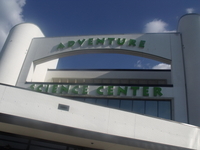 One of our children's favorite places to visit here in middle Tennessee, The Adventure Science Center, was the site of our first field trip this year. 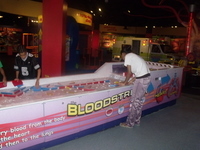 It is such a colorful attraction especially for children with lots of places and things to explore. They got to walk into a room that simulated space and see an incredible array of stars. They could view the inside of a "human torso" and practice putting all the organs back in place. I have to admit this one "stumped" us at first. We kept ending up with a left-over piece so it required several attempts to get it right. Hats off to "Wes-man" who solved the "human puzzle" for us all! 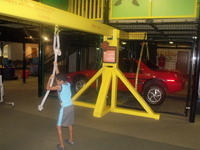 They were able to pick up an automobile to demonstrate the effectiveness of pulleys which is super cool for kids to experience. Probably, the best part of this field trip was the fact that Dad was able to go along with us. Q: What suggestions can you give to other dads to help the homeschooling mom who needs some "Rest and Relaxation" from the daily commitment of home schooling? A: I have found that it helps my wife a lot when she knows that I am praying for her and willing to help her in whatever way possible. She often needs to share the daily joys and challenges she faces so I make myself available to listen to her. I have learned now to ask her whether she wants me "to listen" or give her a solution so we're on the same page. It helps too when we can get away by ourselves to talk. We try to go out for breakfast to one of our favorite places or get away for an overnight trip once every quarter. Incidentally, she asked me this question during such a trip. It was during our anniversary and after we celebrated, I gave her some additional time alone at the hotel to spend however she chose. The time away was very therapeutic and she returned home charged up for the start of school! Next month, he shares an answer to what area, if any, he thinks he can help out more with the homeschooling in our family? If you remember my dilemma from last month when some shelves fell down, I managed to solve my storage issue with this fairly easy and inexpensive solution. I already had one of these RTA organizers from Target that I was using for the childrens games, puzzles, and manipulatives. So, I purchased another and had my sons, ages fourteen and thirteen, assemble it to add on top. There was a little drama when we discovered that the floor isn't level in that spot and the added height of the second unit seemed dangerous and impractical. In the end, they were able to work with my hubby and level the tower and complete the job. I love my new area and they were so happy to help Mom. Remember, you can visit us now on Facebook!